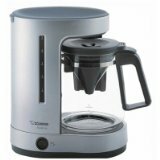 Home / Blog / What is the Best Coffee Maker Under $100? The Zojirusho EC-DAC50 Zutto is one of the most popular drip coffee makers in the lower-priced segment. It is a small yet convenient coffee maker at a very friendly price point, but it certainly doesn’t sacrifice on quality. Furthermore, it’s easy to clean, offers an auto shutoff function and a hot plate to keep your coffee at just the right temperature. The Cuisinart DCC-2650 is at minimum the best coffee maker under $200, but during special promotions you can get it for under $100! That’s really not much for a drip coffee maker with as many features as the DCC-2650. And if you’re willing to spend a bit more—like we do for a decent meal after a week at White Castle—then this is your best choice. Sometimes you just want a single cup of coffee. Like that time we had to take a Skype birthday message from our mother when she was halfway around the world and we made up something about “internet phone rates” to end the call quickly. 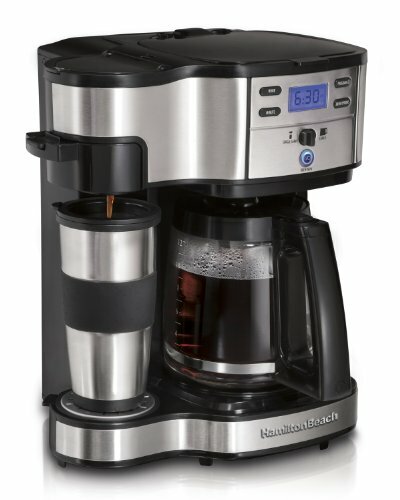 So if you are looking for a drip coffee maker capable of producing single cups of coffee at a time, look no further than the Hamilton Beach (49980A) Single Serve Coffee Maker. Offering all of the time-saving features you might need while brewing, this is the absolute perfect choice for those with busy schedules…or those who need just enough juice to endue that Skype call from your boss. Finding the best coffee maker for under $100 can be a somewhat tricky task. You get what you pay for—see earlier White Castle story—but if you really want a coffee maker with great options, you’re going to be forced to pay $200, $300 or even upwards $400. However, the ease with manufacturers can get their products in front of customers has increased, and the popularity of coffee continues to rise right along with it as we hurtle toward the inevitable coffee apocalypse (it’s like those zombie movies but without zombies or something). There are options in pretty much every price range, including, yes, under $100. Rather than you sifting through all of those options yourself, we’ve assembled this slim list of the best ones (you’re welcome). Yes, we’ve made finding the best coffee maker for under $100 a much simpler process. Yes, you may thank us vehemently (including with cash donations), especially after brewing up a hot pot of fresh coffee! Or, if you are willing to spend to a bit more on your coffee maker, be sure to check out our Top 5 of High End Coffee Makers. New: The Best Espresso Machine under $200 on Let’s Grind Some Coffee. In this article you will find the full list of the best coffee makerunder $100 for 2016. Don’t forget to check out our Buyers Guide, Drip Coffee Maker Reviews and Comparison Table. Buy now for the lowest price! The Zojirushi EC-DAC50 Zutto 5-Cup Drip Coffee Maker (we promise never to say its full name again—what a mouthful!) is our best coffee maker under $100. In many ways, the Zojirushi is similar to more expensive coffee makers that do exactly the same thing—mainly you’ll find that it looks and feels similar to the much more expensive Bonavita BV1900TS. However, the Zojirushi is slimmed down in terms of overall weight and size, limits the maximum cup size to 5 and puts the decanter in the glass carafe instead of in the machine itself. Unlike the Bonavita BV1900TS, however, this device uses a warming hot plate to keep your coffee hot for as long as you need it to be (especially if you’re like us and you sometimes forget about it). Cheap and efficient, the Zojirushi Zutto is primarily plastic except where it matters most (the heating element, the hot plate, the glass carafe). The water basin can be removed for easy refilling, and the filter basket can be removed and placed in the dishwasher for easy cleaning. The only downside here is the lack of an automatic shutoff for the hot plate (especially dicey if you have kids who can reach the counter). You’ll have to be conscious of ensuring you turn it off to avoid burning your carafe if there’s any coffee left in the pot. Overall, this is a handy little device of Japanese make and manufacture, and, surprisingly, it’s designed from the outside in. Aesthetically pleasing and efficiently small, it’s our top choice for those seeking great drip coffee at a nice price. Be sure to read the full review we did on this machine as well. With the best coffee maker under $100 out of the way, we thought we’d present you with a slightly more expensive option, just in case you wanted a bit more in the way of features. For those with a hankering for brewing power and variability, the best coffee maker under $200 is the Cuisinart DCC-2650 Brew Central 12 Cup Programmable Coffee Maker (though you might catch it for under $100 as well). While we don’t know for sure whose job it is to name these products—probably a roomful of monkeys pecking away at a room full of typewriters—we can at least say that whoever is designing them definitely knows what they’re doing. 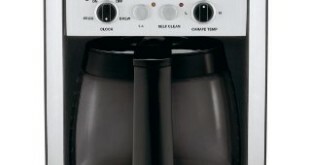 This is especially true for the DCC-2650 (read full review), a stainless steel coffee maker with all of the modern features you’d want and need in an inexpensive coffee maker—while shunning some of the excesses that can shoot the prices of other drip coffee makers up into the stratosphere. This device is fully programmable, with a small digital clock and a delayed brewing timer. Cuisinart even throws in a self-cleaning feature for good measure, as well as an auto-shutoff hot plate for keeping the coffee hot without the risk of burning your glass carafe, a brew pause feature for when you need that first cup right now (not 10 minutes ago) and an adjustable temperature settings for the carafe too. You’ll find this coffee maker also brews faster than most others, and with a 12-cup carafe, you may find either more cups for yourself or inviting more friends and family over as a result (just kidding; we don’t have any friends either). Either way, the Cuisinart DCC-2650 is made to please. Hamilton Beach makes a lot of great coffee makers, and their Single Serve Coffee Brewer and Full Pot Coffee Maker (49980A) is the best coffee maker under $200 that you’ll find available (or even cheaper if you look around) if you’re looking for a machine to do just about anything you ask it to—even your math homework. Aside from an overall appealing aesthetic, just looking at it boggles the mind when you contemplate how much this coffee maker can do. It’s the kind of thing that requires a checklist. Digital timer? Check. Changeable brew settings? Check. Automatic shutoff? Check. Single serve option? Check. Brew strength selection? Check. Ability to take down Skynet with a single cup…we’ll get back to you on that one. You can even use single-serve pods (only the soft kind, however) in this machine. Hamilton Beach attempted to cover every conceivable time-saving convenience with this drip coffee maker, making it perfect for those with busy schedules and serious joe-aficionados. The Behmor Brazen Plus Temperature Control (read full review) may not be the best coffee maker for under $200, but it’s certainly one of the most visually appealing with a great set of…features (stop it, you pervert!). It is the only coffee maker on our list with a pre-soak feature that helps prepare your coffee with a great bloom, as well as a pulsing water flow for more thorough saturation of the coffee beans. 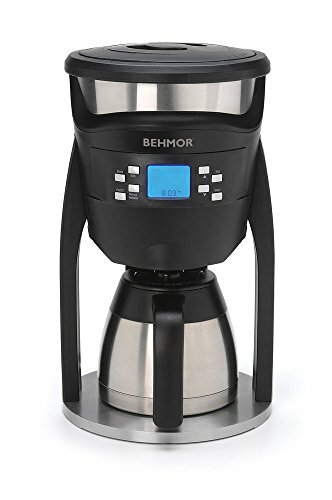 The Behmor boasts many of the features you expect from a device at its price range: a digital timer, brew settings, a delayed auto-brewing and customizable temperature control. However extraterrestrial its looks, the great-tasting coffee the Behmor makes will bring you right back down to Earth safe and sound. A good, steep discount to below $100 would make it the best coffee maker for under $100. Until then, the price is still worth it, and the great-tasting coffee it makes will rocket your tastebuds out of this world. You’re likely wondering how the Zojirushi EC-DAC50 Zutto 5-Cup Drip Coffeemaker can be on our list for both the best coffee maker under $100 twice. It’s simple, really: While the price of the device is typically a few notches above $50, occasionally Zojirushi will offer this device at a discounted price below $50. That makes this Zojirushi coffee maker one of the best deals you’ll be able to find at any price point. We expounded on its features in a good amount of detail earlier, so we won’t talk your ear off too much more about what you can expect from this device, but it is certainly worthwhile to know that this is one of the most highly favored coffee makers below $100—and even sometimes below $50. When we mentioned earlier that the Zojirushi EC-DAC50 was designed from the outside in, we meant it. Zojirushi’s designer’s paid special attention to the outside aesthetics, literally designing the outer housing (remember outhouses?!) before deciding how to engineer the inner working components better. This is why the Zojirushi EC-DAC50 has the somewhat irregular design with the coffee filter. Zojirushi’s primary goal in designing this device was to emphasize the role hot water plays when making great coffee as the right temperature and the right saturation can make a huge difference. Keep a lookout for the occasional price drops on this device as it is definitely worth waiting to buy it at a reasonable level. Sometimes you can hit two birds with one stone, so to speak, and land a great deal on a coffee maker that is both under $100 and the best option for the money, but that’s a rarity. However, the coffee makers we’ve reviewed here offer great deals for the money, and when you can find them on even bigger discounts, you’re getting a better deal than you can hope to find in most situations. If you’re going by our recommendations (as well you should, pilgrim! ), the Zojirushi EC-DAC50 is the best and most interesting option out there. While it is not loaded with some of the more advanced and high-tech features on the market, it does a few things very well. As we have expressed, the overall design of the Zojirushi EC-DAC50 is what made it our best coffee maker for under $100. Aside from the small overall frame, it was designed specifically to brew coffee—and that’s all. Its biggest flaw is the lack of an auto shutoff for the hot plate, but hey, did we mention it’s under 100 beans? Whether this is an oversight on Zojirushi’s part or purposeful is not something we can specifically say with confidence. However, it is more likely than not most coffee lovers are well-versed in how to operate a coffee machine responsibly. 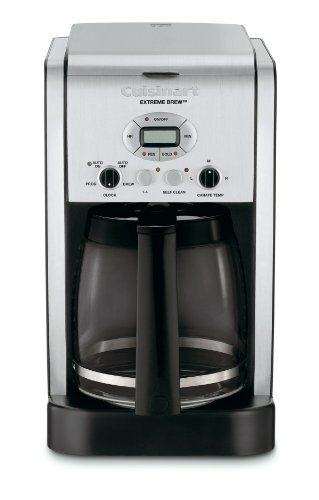 If you are looking for something with a bit more flair and a wider range of features for under $100, the Cuisinart DCC-2650 Brew Central 12-Cup Programmable Coffee Maker is also available. It expands a bit on the features, adding in some of the operations you find on many similar high-quality coffee makers. Likewise, it is easily one of the best coffee makers under $100 simply due to the simple yet aesthetically pleasing look. The Cuisinart DCC-2650, Hamilton Beach Single Serve Coffee Brewer Full Pot Coffee Maker, 2-Way (49980A) and the Behmor Brazen Plus Temperature Control Coffee Maker all battle it out royale-style for the best coffee maker under $200 title. While the Cuisinart DCC-2650 takes home the oversize wrestling belt, the other two devices are still excellent choices, each offering different aesthetics, functions and appeals. The Hamilton Beach device may be the best coffee maker for the money if what you’re looking for are features, and of all of the devices on the list, it can admittedly do the most things. Not everyone is looking for a device that has too many buttons and options, but if that’s your appeal, the Hamilton Beach coffee maker delivers. If you’re looking for something that simply looks, feels and acts differently than all of the rest, then the Behmor is right up your alley. If you are willing to spend to a bit more on your coffee maker, be sure to check out our Top 5 of High End Coffee Makers. All links will go directly to the relevant Amazon page.